As the sun set on Nov. 8, two American flags could be seen above a crowd gathered at the corner of Main Street and East Wheelock Street for a protest called “Nobody Is Above the Law — Mueller Protection Rapid Response.” Over 100 protestors assembled at 5 p.m.
On Monday, White River Junction witnessed an addition to its culinary diversity. Phnom Penh, the Cambodian restaurant that has been operating at 1 High Street, Lebanon for a year, opened a new location at 7 North Main Street in White River Junction. On Nov. 1, individuals from across campus gathered in Collis Common Ground to hear business ideas from students, faculty and staff in The Pitch, an entrepreneurship competition hosted by the DALI Lab and the Magnuson Center for Entrepreneurship. Ben Robbins is a beloved Dartmouth Dining Services employee at Collis Cafe. Best known for working at the pasta station, Robbins has also been working at the stir-fry station this term. Jin Woo Kim, a postdoctoral researcher in Dartmouth’s Quantitative Social Science department, pounced on an opportunity for discovery in then-Judge Brett Kavanaugh’s confirmation to the Supreme Court. There was standing room only in Paganucci Lounge as students, faculty and Dartmouth community members attended an anti-Semitism panel featuring College President Phil Hanlon. In response to the recent massacre at the Tree of Life Congregation in Pittsburgh, Hanlon hosted the open community discussion on anti-Semitism and its history and dangers with fellow panelists Chabad Rabbi Moshe Gray and Jewish studies professor Susannah Heschel. Following Friday night’s shooting on School Street, many Dartmouth students no longer feel safe in Hanover. Carlos Polanco ’21 said that for many who come from areas where gun violence is common, “Hanover was an escape from that.” He added that before Friday, he considered Hanover a “bubble of safety” and that Friday’s shooting “shattered” this idea and caused him to re-evaluate how he felt on campus. “For many people, [the shooting] was a wakeup call to the fact that Dartmouth is not an isolated bubble from the rest of the world,” Jennifer West ’20 said. Mariana Peñaloza ’22 said that she, too thought she left violence behind when she came to Dartmouth. On Nov. 6, Dartmouth students and Hanover residents voted at Hanover High School with a turnout comparable to the 2016 presidential election. Dartmouth computer science researchers studying text translators recently turned to an unlikely source to gather data: the Bible. The purpose of the team’s research was to create a highly trained algorithm that can read text written in one style and re-write the text in a different style with the same meaning. 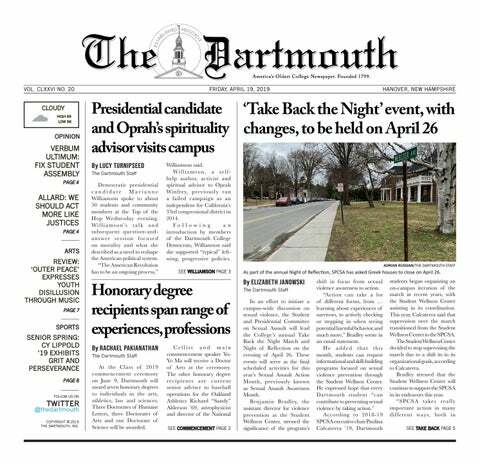 On Nov. 3, Zachary Benjamin ’19, current editor-in-chief of The Dartmouth, was appointed as the newspaper’s acting publisher. Stop and smell the roses — but perhaps not in the Class of 1978 Life Sciences Center greenhouse, home of Dartmouth’s very own Amorphophallus titanum, which bloomed this past weekend. Patients with hard-to-treat scleroderma will be happy to learn that an effective therapy for their painful autoimmune rheumatic disease may be soon in sight. Molly Kelly, who recently won the Democratic primary for governor and will face the Republican incumbent, Chris Sununu, at the polls on Nov.
An arrest has been made following Friday night’s shooting. Gage Young, 22, of Lebanon, New Hampshire was arrested for second degree assault at 2:47 p.m.
Every year toward the end of fall term, the Lone Pine becomes the Giving Tree. Dartmouth’s annual fundraising campaign to support the Granite United Way began on Oct.